This book was not what I expected. Vallotton spends the most emphasis making a stark juxtaposition between the Old and New Testaments, and OT and NT prophetic attitudes. I do not agree with his theology on this, even though I do come to his same conclusion that prophecy must highlight and reflect God’s love in a beneficial and uplifting manner. I prefer to focus on the unity and continuity of the Scriptures, and think it would be helpful for believers to recognize and embrace the abundant love, grace, and goodness of God even before Jesus enters the scene in human form. I felt like Vallotton was reacting to the modern “judgment prophets,” which he reveals a personal bias against, rather than giving a thorough exegesis. He seems to resist drawing the connection between God’s forever goodness in order to avoid embracing the continuity of judgment and justice into the contemporary realm. I would argue that we just need to define and understand judgment in a healthy way, recognizing that this part of God’s nature has always stemmed from His great love for the whole world. Once Vallotton really settles into his message regarding the role of the modern prophet, his teaching is really excellent: encouraging, thought-provoking, inspiring, and helpful. As always (I have read a handful of his books), his personal stories and analogies are insightful and engaging. The book becomes stronger as it goes along, and I especially loved his commentary on Joseph and Daniel toward the end. He describes the interesting dynamic these men had of being God’s prophets in the midst of pagan nations, and what it looks like to bless and honor pagan leadership, thus earning a voice and attention. 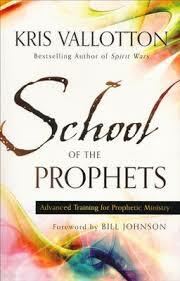 I also really liked his list of six prophetic models based on the OT prophets (e.g. prophets who served leaders regarding governance, prophets who served leaders regarding only their personal lives, prophets who led countries themselves, and so forth). He wrote only briefly on this, but I think it could be a work in itself.